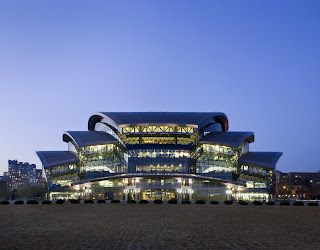 This beautiful building which is home to the Sungkyunkwan University Samsung Library represents the image of an open book and was opened in 2009, which seems unbelievable as it not only looks brand new from the outside, but is also still in pristine condition on the inside. The Samsung Library has been developed as a "gateway to knowledge to nurture the creative potential of its students, faculty and staff through accessing global knowledge" (SKKU promotional material) The Library provides additional support to learning and supplements facilities found in the University Central Library. The building provides accommodation on 7 floors above ground and 2 basement floors. Floors 6 and 7 are dedicated to the administrative function. A number of group study rooms have been provided between floors 2 and 5 which provide views of activity within and allow the occupants great views of the rest of the building. 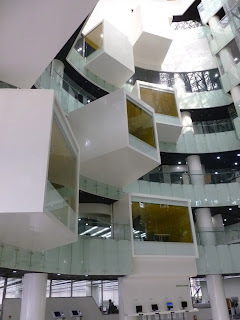 As soon as you enter the building the sense of space and height is almost overwhelming, and I couldn't help but be "wowed" by the sheer size and beauty!! Located within the entrance hall are the now familiar student study space booking kiosks and the Global Lounge PCs. To the left and right of the entrance barriers are the entrances to the Information Commons, as shown in the photo above, and one of the reading rooms. The style of the PC clusters are very familiar also. There are over 3,000 study spaces available within the reading rooms throughout the building, all of which are bookable through the kiosk system. 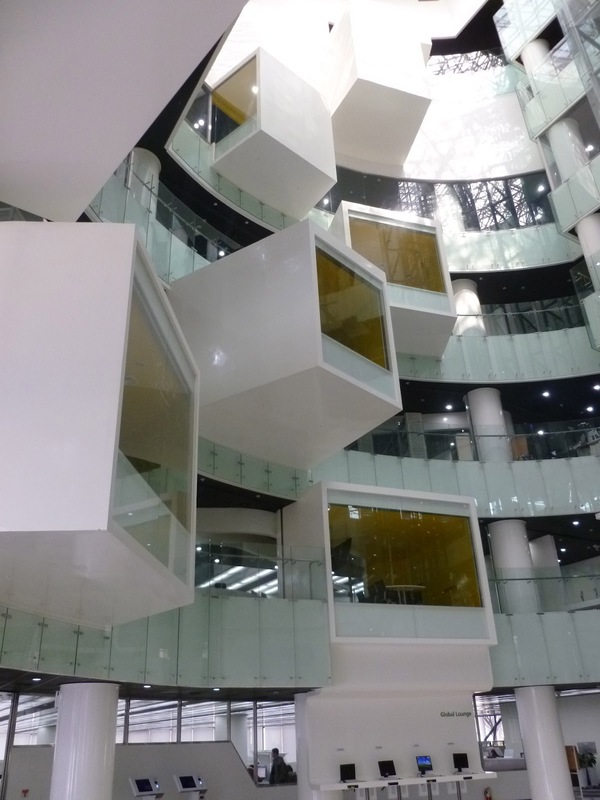 The Lower ground floors provide a range of amenities to students. Underground level 1 is an area for study and cultural exchange featuring a 24- hour reading room, book and journal stacks and an auditorium. 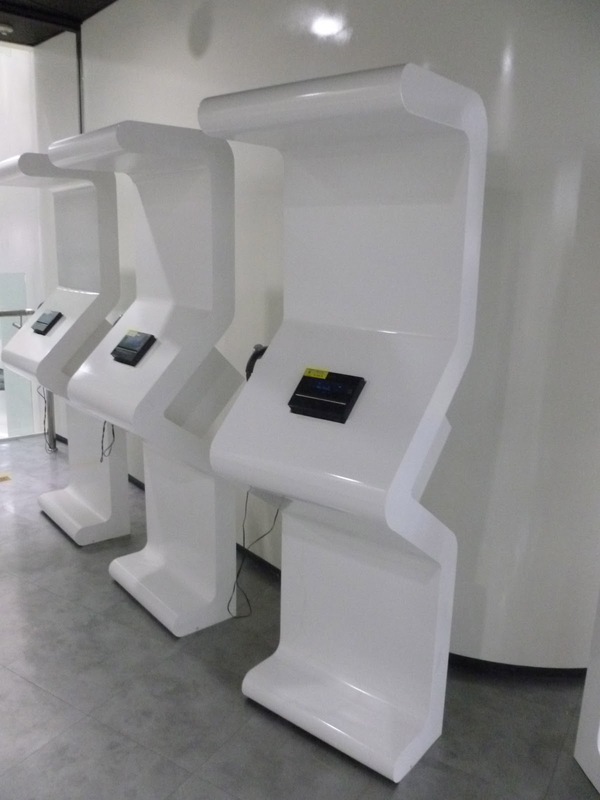 Also within this area, there are over 1,000 digital lockers, providing secure storage facilities for both immediate and short term needs and longer periods. The lockers are set up to provide the students with a range of options. Lockers can be booked for 1, 3 or 6 months, and in this facility, the lockers on the top 3 rows are programmed for longer term hire. The lockers on the other rows are available for short term, ad hoc booking, and can even be booked by individuals or students can arrange to share a locker. This system has proved to be enormously popular with students. Also coated on the lower ground floor is an auditorium, again, it is becoming familiar to find lecture theatres being included in Library construction here. Once again, the set up is for both active participation (front two rows, mainly conference activity) and for a general audience. Support is provided by Library staff. The Book and Journal area provides students with access to texts not freely available on the library bookstacks elsewhere in the building. The students select their texts, again using a kiosk system, print a booking slip which they then hand to the librarian. The Librarian then collects the texts from the secure stacks. Located on Floor 2 is a multimedia complex providing facilities including AV equipment, a cinema room and a media editing room. The range of facilities available is quite surprising, not only modern equipment as we would expect, but some "legacy" equipment also to ensure that all media can be accessed, although it is acknowledged that some of these facilities are seeing less and less use. These CD stations remind me of the 60's when you went to the record store (yes, vinyl) and got the latest disc played before you decided to buy! The Students can also take online courses here. Level 5; The "Free Community Zone"
This level is designed to accommodate a number of activities including study, exhibitions and cultural events. There is a cafe located on this floor in an area that provides fantastic views across campus and wonderful light. On the 2nd, 3rd, 4th and 5th floors there are a range of group study rooms of various sizes. Most of them overhang and overlook the atrium providing interesting views for the occupants and onlookers. The study rooms are very simply furnished with tables and chairs. Some of the larger rooms have display facilities. My visit to the Library was quite early in the day, which is why there were not so many students around, but that made it easier to talk in more detail about the facilities and take pictures. This Library is a wonderful environment for learning. The design of the space is such that the building feels friendly, informal and comfortable, and the light everywhere is truly wonderful. There is a feeling of space in all areas, and of course there is plenty of space for all the students and the rich and varied activities being undertaken in the building. Yes, the lack of cables is something that I have found really impressive in all of the Libraries, and is something I will be taking back to my institution. Also, it is an enormously interesting and rewarding trip so far!! Fab pictures, it gives us some fantastic ideas for our new library... love some of the study areas. I was particularly interested in the enormous seventies sci-fi CD listening station - do computers not play CDs over there? Very odd! Its very smart and uncluttered, lost of investment and thought behind it. Maybe its just me but doesn't feel very warm and inviting if I had to offer some critique. I liked the yellow cafe, bit more welcoming. Fascinating again tho Toni, great stuff. 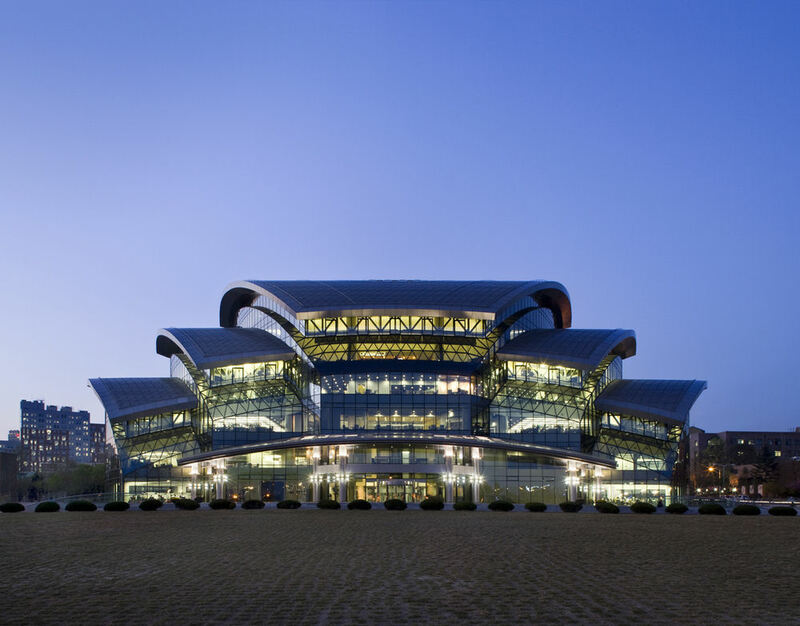 All of the libraries visited in Seoul were incredibly tidy with all chairs in exactly the right place, but no evidence of staff going around tidying up, in fact a feature of all of the libraries was the low number of staff visible on each floor. With this library, the major feature was the light, virtually very part of the library had good light to work in, no gloomy corners or lots of artificial light. now, I saw it on a glorious day, so not sure what the effect would be on a cold winter day! So i was right after all we do no need plastic trunking!!!! It is a very beautiful building, the students here are very lucky! Absolutely stunning. It looks like a building where the future is created.